If you are a developer writing a plugin or theme for WP-Lister for eBay, you might find the following filters and actions hooks useful. Call this action after you have changed the price or stock level of a WooCommerce product. It will send a ReviseInventoryStatus requests to eBay, which will update price and inventory but leave all other details untouched. This will send a ReviseItem request to eBay, which will update all item details. Use it when you need to update details other than price and stock level. Revising an item is considerably slower than revising the inventory status, so if you have to change many listings at once, consider using wplister_product_has_changed and clicking the Revise all changed items button in the UI. Note: A listing will end when it is revised with a quantity of zero. Relist an ended listing on eBay with this call. This might be required if you change an out of stock product to be in stock again, as a listing will be automatically ended when its quantity reaches zero – so if you are changing a product from out of stock to have stock again, you need to tell WP-Lister to relist the ended listing. This will end a listing on eBay. Accepts an eBay Item ID or a $listing_id as parameter. To end a specific $post_id, fetch the $listing_id as shown in the example below. Available since 2.0.9.10. Prepare a new listing from a WooCommerce product and apply a profile. This hook is available in version 1.5.0.5+. Mark a product as changed in WP-Lister. 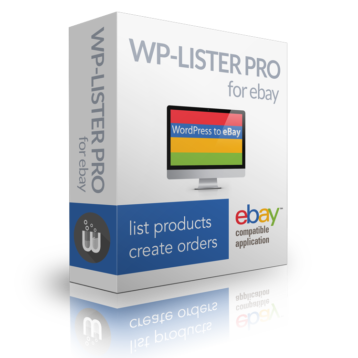 Use this if you need to emulate how WP-Lister behaves when a product is updated manually in WooCommerce: The profile will be reapplied to update dynamic prices and custom quantities, but the listing is not updated on eBay right away – instead, its status is set to changed and WP-Lister will prompt the user to Revise all changed items. Just make sure you use the meta key which is updated last – which is _price in this case – so if for example your plugin would update stock levels after updating the price, you should use _stock instead. This filter allows you to use custom post meta data that might exist in your wp_postmeta table like a WooCommerce attribute which can be mapped to item specifics required by eBay. The example below is taken from WP-Lister itself and it is used to make the SKU available for item specifics. This filter allows you to process the listing description HTML after the template was applied. // Note: this example requires WP-Lister version 2.0.9.17 or better! Use this filter to define a custom main product image for your listings. This can be useful in many cases, including a site that uses transparent PNG images on the website, which unfortunately are not compatible with eBay. The example below assumes that you are using the Advanced Custom Fields plugin (ACF) and have created a custom field called “ebay_product_image” in order to override the default featured image on eBay. Use this filter to apply a custom rounding function to the price on eBay. This can be useful if you have set a percentage in your listing profile but don’t want to have “odd” decimals (cents). This filter allows you to automatically populate the eBay tracking number on an order details page. Available since version 1.5.0.5. This filter allows you to automatically populate the eBay shipping date field on an order details page. Available since version 1.6.0.2. This filter allows you to automatically populate the eBay shipping provider field on an order details page. Available since version 1.6.0.2. This filter allows you to customize the list of available shipping providers on the order details page. Available since version 1.5.0.6. This hook allows you to modify the data that will be provided to eBay when marking an eBay order as complete and is especially useful when you need to submit custom tracking information to eBay. The sample code below pulls the tracking information from the YITH WooCommerce Order Tracking plugin. Use this action hook if you need to post process WooCommerce orders that were created by WP-Lister. The example below will remove the email address from the WooCommerce order, which might be useful if you want to make sure that no other plugins (like the Follow Up Emails extension) could accidentally send emails to the email address provided by eBay. Important: If you use this hook to process order line items, please keep in mind that WP-Lister might create orders for products which do not exist in WooCommerce! That is the reason why we named the hook this way: Not because it would only fire for non-existing products, but because it can. And if your code does not expect this, it might break the synchronisation of sales or worse. Use this filter to manipulate listing data before it is sent to eBay during a AddItem or ReviseItem request. This feature is very powerful and should be used carefully. Available since version 1.5.0.2. Filter local and international shipping services sent to eBay during a AddItem or ReviseItem request. The example below removes a specific shipping service if the product weight is greater than 13oz. Available since version 2.0.9.8. Filter the listing title when splitting variations into single listings. The example below adds attribute name and attribute value. By default, only the attribute values are added. Available since version 2.0.9.9. Filter HTML attributes for the iframe tag used by gallery widgets. Available since version 2.0.9.9. Mark a specific order as shipped on eBay and optionally send tracking details and seller feedback. Available since version 2.0.9. This is not a WP hook but a publicly available PHP function to query the listings table. It can be useful in your custom PHP code when you need to get one or all listings for a particular status, SKU, or any other column of the wp_ebay_auctions table.